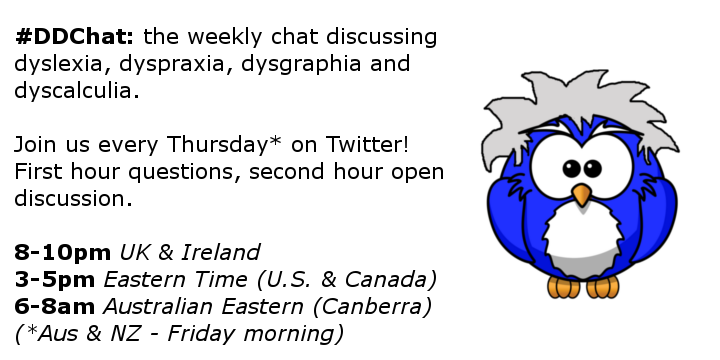 #DDChat, the Twitter chat discussing all things dyslexia, has become a weekly chat! It takes place this evening 8-10pm GMT (that’s UK time and we are now in BST – British Summer Time, so make sure if you are outside the UK to double-check the time). As always, the chat is all to do with dyslexia and you can get involved using the hashtag #DDChat. The first hour consists of the questions below and the second hour is an open floor to either continue discussion from the questions or to discuss anything dyslexia related. First of all a massive thank you to everyone who took part in yesterday’s #DDChat on Twitter discussing all things dyslexia. It was the best one yet, I couldn’t keep up fast enough with the fantastic discussions! We decided last night that #DDChat will now be changing from a monthly chat to a weekly chat taking place every Thursday from 8-10pm GMT with the format of an hour of questions followed by an open floor for discussion. If you have any topics you would like us to discuss, then please go to the #DDChat tab at the top of the page and fill in the form. I hope to see you all next Thursday on Twitter! There have been some brilliant questions put forward for this month’s #DDChat. The Twitter chat will take place tomorrow at 8-10pm GMT (that’s UK time). For those in North America, please double-check the times as we have not had our daylight savings yet (I missed a chat today because I was an hour out). I didn’t see the point of it before but I absolutely LOVE Twitter now. 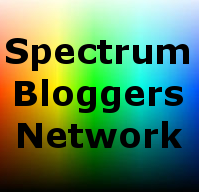 I’ve been using it to advertise this blog of mine, but have found out in the last year just how wonderful Twitter is for interacting with people across the world. It’s great for raising awareness and for finding like-minded people without being swamped with all the personal details and dramas of Facebook. I can Tweet as often as I like without people kicking off which is great because my short-term memory is so bad that if I don’t get something out of my head then I lose it completely. Tomorrow is the second #DDChat on Twitter. #DDChat is a monthly chat dedicated to all things dyslexia related. It takes place on the last Thursday of each month, 8-10pm GMT using the hashtag #DDChat. I am moving #DDChat from Dyslexia: Dysassemble over here as there is no traffic to the other blog. It had a positive start but without help it nose-dived. So #DDChat, the monthly Twitter chat dedicated to all things dyslexia is this Thursday 8-10pm GMT. The first hour will consist of a number of questions. I will post the questions on here tomorrow. The second hour is a ‘free for all’ chat.